The Tree of Life is more than just a thing to study. It is an active learning system that you can and do use for your own evolvement. How do you use it? Well if you are mostly unconscious of its use, then you enter it in your dreams. However dreams is not the only way to enter this learning system. You can take your learning and initiation into the Tree of Life to a more active and conscious state by using lucid dreaming, travel meditations, and out of body travel. When you make this conscious leap, you have multiplied the power of your own advancement hundreds of times. It is this conscious use of the Tree of life that this article deals with so let's start here. First I'm not going to discuss any specific ways to get to the Tree of Life. Suffice it to say that on the website and in my book series there are enough articles on lucid dreaming, out of body travel, and meditation to help you along with that. 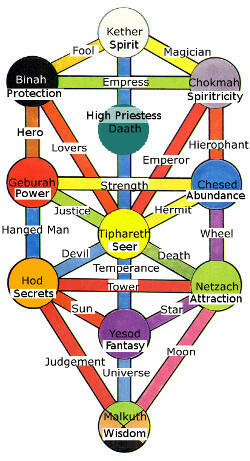 Rather here I am going to focus on how to use this information you gather once you enter the Tree of Life. If you are just beginning to explore the Tree of Life on a conscious level, you have to be initiated into this learning system. This initiation is a way that your sincerity and your desire to use the system can be tested. Beginning adventures and initiations start in the sphere of Malkuth. The archangel Sandalphon presides over this sphere and it is him (or her) that will initiate you. On your first attempts to enter the Tree of Life and the sphere of Malkuth you may only see a dark violet color or haze. You may only feel energy. Be patient these first few attempts that seem to go nowhere are preparing your body, mind, and spirit for the trip. At some point the violet mist will go away and you may see glimpses of yourself standing in some grassy place, on a beach, or in a forest. You could also see something else. The thing to keep in mind is that Malkuth is very physical like, so what you do here will be very physical. You may again just spend several of your trips to this starting location in Malkuth all by yourself, just getting used to the idea that you are in a new place. Once you start to walk around then things will happen. At some point someone will approach you. Most likely this will be Sandalphon in one of his many forms (king, man in shorts, priest, beautiful princess, bishop, more). He may ask you to perform some task. This task is part of your initiation. Most first tasks involve going partially up the Tree of Life to life-lesson junction points. By tradition these points correspond to certain cards on the tarot system. If you look at the Tree of Life map with the tarot card locations, you will see that half way up the three tunnels that come out of Malkuth you will find Judgment, Universe, and the Moon. Each of these life-lesson junction points is a different lesson. The task Sandalphon gives you for your initiation will most likely involve traveling to one of these places, carrying out some task, then returning. What that task is will differ from individual to individual. However upon successful completion of that task and upon your return to Malkuth, Sandalphon will reward you with a gift. This gift is not only symbolic of some kind of new power or skill that you can develop or have, it also is a signal that you have completed the initiation and can now travel anywhere you want in the Tree of Life. These gifts vary but some of them are books of wisdom, rings, swords, potions, scepters, crowns, flowers, boxes, chests, and much more. Keep in mind Malkuth is a physical place so what you get will be very physical in nature. I have been a bit vague about this first adventure because I do not want to spoil your surprise or the lessons. Now the importance of knowing the tarot card locations and the card pictures will help you to determine where you went in the Tree of Life and what you were learning there. It also is good to know these life-lesson junction points so that you can go there yourself if you want to learn that lesson or acquire certain information. This action is also how you use the rest of the Tree of Life spheres as well. I started with the tarot card junction points because these are the first things that a newcomer will encounter before his initiation. After that you will find that you can wind up anywhere in the Tree of Life doing or learning something. Where you wind up is a matter of what you need for your evolvement and for your current physical circumstances. The Tree of Life Tech sheet is a great tool to keep handy as you can often use it to look up the various aspects of your adventure to see where you have been. For example the tunnels that connect each sphere are different colors of banded light. The color of the tunnel you see as you travel from Malkuth up the Tree is an indication of where you are going. For example, traveling up a dark blue tunnel from Malkuth and coming to a violet door could be in indication that you went from Malkuth to Netzach. Of course this example is just that an example and your adventures may differ. Each Tree of Life sphere is very different from the others, so it is not too hard to tell them apart once you have been there once. Again I could tell you how each of these spheres appear but it is much more fun and personal to figure that out yourself. I am just pointing you in the correct direction here with this article. Well that about finishes up this Tree of Life walk through for you. Now go enjoy and explore; it is a wonderful and rewarding learning system that you will always cherish.